An ABC, if you’re not familiar with the term in this context, is an American-Born Chinese. I’m what you might call a Lapsed and Guiltily Trying to Atone ABC, something many of my peers will immediately understand. One of the areas I’m trying to improve is my cooking – I grew up eating mostly frozen food (hence the love for Pizza Rolls) and cream cheese sandwiches with my dad, so though he did cook a few dishes, I didn’t really learn how to cook much of anything until I was in grad school. This particular dish, a spin on the famous Sichuan double-cooked pork (回锅肉), was taught to me by my mother last year. 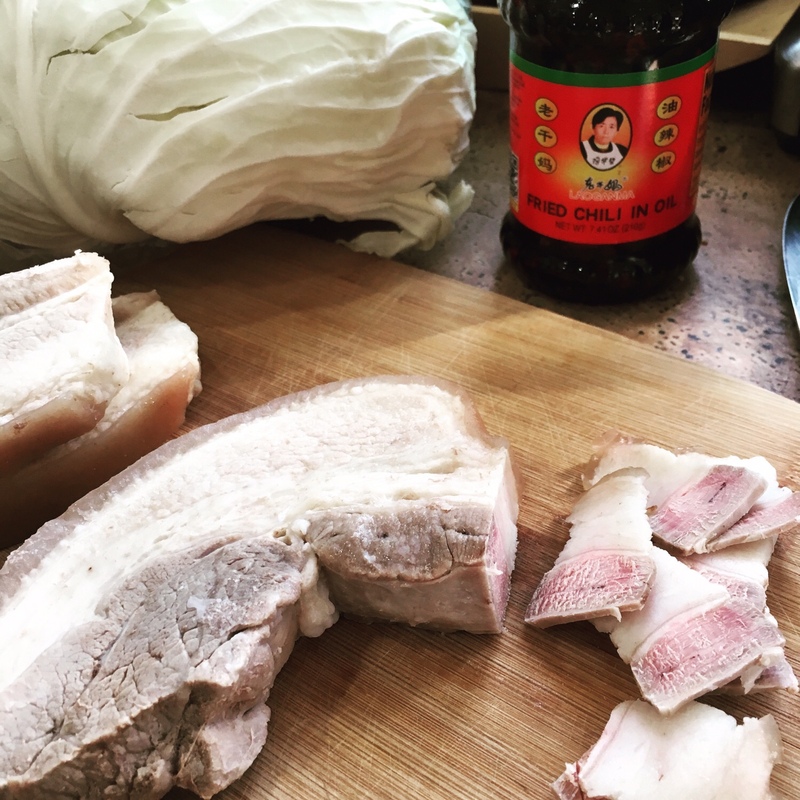 She is not an ABC, but between being a simplified recipe, using relatively easily-sourced ingredients, and us being Shamghainese and not Sichuanese, I think it’s fair to call this an ABC take on double-cooked pork. Lao Gan Ma is a famous and pretty common brand of sauces – I’ve seen this fried chili in oil in regular old American supermarkets and on Amazon, although of course it’s cheapest at Asian supermarkets. I’m not sure what substitutes would be beyond making your own fried chili oil, but I assume there are some. I also use Taiwanese cabbage because it still has a little bit of crunch after being cooked down, but you can use regular cabbage, it will just lack some of that all-important textural contrast. It’s more traditional to use leeks or garlic greens along with some fermented sauces, so you can sub those in or also add them if you want – the cabbage and LGM fried chili oil is far easier to source and prep, though. I’m fortunate to live in a city with two Chinese supermarkets (Asian Food Market and 99 Ranch), but I still prefer to cook simply where I can. You may want to halve the recipe by prepping the pork belly up to the point of slicing it thinly and store half of it to cook later with the other half of the head of cabbage – the full recipe is unlikely to fit in most household pots. Place pork belly strips in a pot, cover with cold water, and bring to a boil over high heat. Keep boiling until just cooked through, about 20 minutes. Remove pork and place on a plate or sheet pan until cool. Cover and refrigerate until firm, preferably overnight. Slice cold pork belly into thin slices. Heat some oil over high heat until smoking and stir fry the pork belly slices until starting to crisp (think: bacon). If, like me, you’re down with a little straight MSG, add it with the pork slices. Remove pork belly with a slotted spoon to a bowl and set aside. Return pot and remaining oil/rendered fat to heat. Add cabbage and stir fry until translucent and a little soft – you may need to add the cabbage in batches to fit. Once cooked, the cabbage will lose more than half its volume. Turn the heat down to medium. Add chili oil (with sediment and peanuts!) and return the pork slices to the pan. 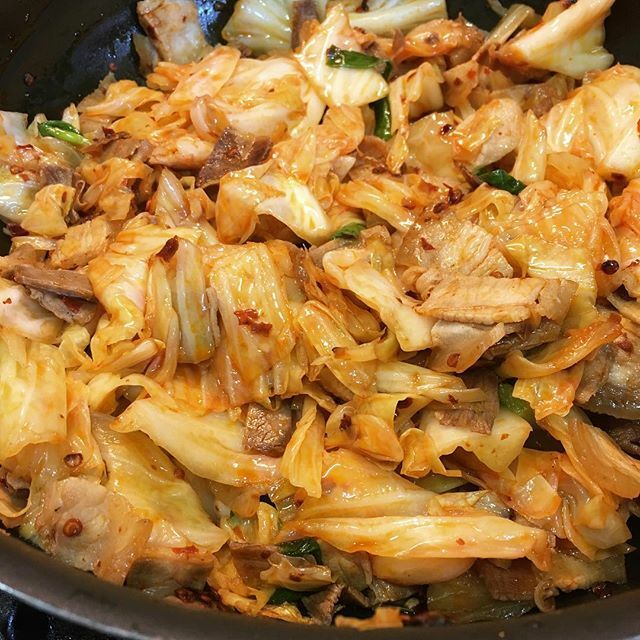 Add a splash of soy sauce and the scallions and stir fry until the cabbage is mostly soft with just a little bite and the chili oil permeates everything. Add salt to taste. Serve as a part of a many-dished family dinner or by itself over rice for a quick lunch. Leftovers can be reheated on the stovetop or in the microwave, but be careful not to overheat the pork. Freezing is not advised, as it will likely change the texture substantially. → Sometimes the best meals are the simple(-ish) ones. ← Digging these luggage tags as wedding favors/seating cards.